If you are using RedPodium as well as GroupRev, you can prompt your registrants to setup a GroupRev page when they are done registering for your event. We recommend adding the GroupRev link to the Confirmation Screen and Confirmation Email of your RedPodium registration form. 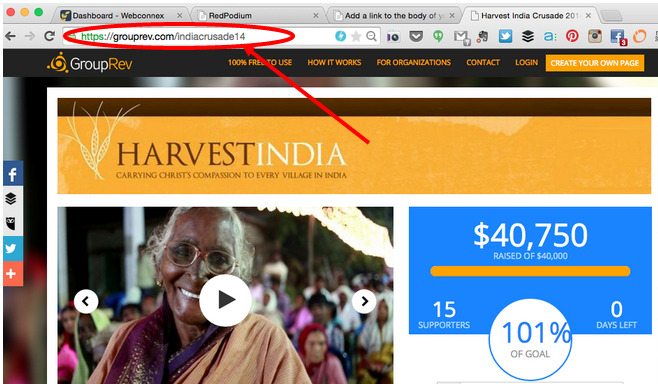 That way people can register for your event, then customize their donation page. 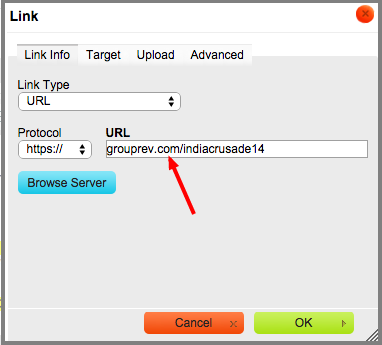 Step 2: Log into your RedPodium account and click Edit on the campaign you want to link GroupRev to. Step 3: Click on the Confirmation tab. Then type text into the confirmation page/email and highlight the text with your mouse. This text will become the hyperlink to GroupRev. In this example we wrote "Click here to start fundraising"
Step 6: Your text will now show as a hyperlink for your participants to click.